Beans, Bullets, Bandages, and Barter items are the staples of any preparedness plan. 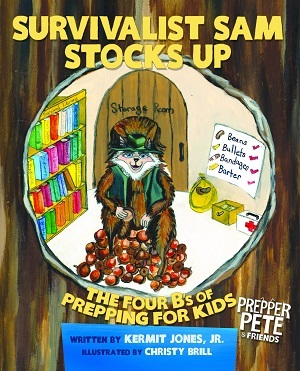 Join Prepper Pete’s best friend, Survivalist Sam, as he explores the Four B’s of prepping and many of the fun things your family can do, too! Children will love this fabulously illustrated book that shows them, in a fun and non-threatening way, how to be ready for the unknown. The topic of stocking up doesn’t have to be reserved for prepping and survival! Many activities, from gardening and canning, to first aid and reading, can engage kids of all ages to learn useful skills that will prepare them for the rest of their life. The Four B’s are important in many situations, though sometimes in a different order. Talk to your kids about safe shelter in a storm, or being aware of strangers; take a first aid class with them to learn new skills. Encourage reading and critical thinking. Don’t scare… prepare! “Some people prepare because they are afraid.